Celebrate Halloween with "no tricks, all treats" on this sampler featuring Kreinik's glow in the dark #4 Braid! 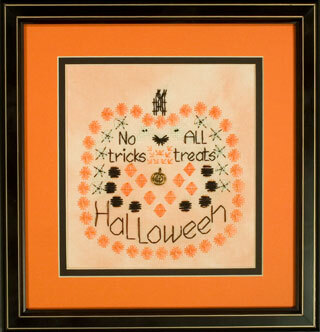 A grinning Jack-o-Lantern is surrounded by ghosts, spider webs and bats, worked with Crescent Colours Tangerine and Kreinik #4 Braid. Stitches include double and tie stitch, Rhodes, tied butterfly, cross stitch, French knots, backstitch, crow's feet, spider web, beetle and queen stitches. 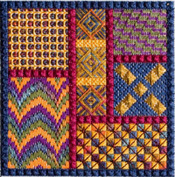 Sampler is 5 ½" x 5 ¾", 78 x 80 stitches on 28 ct. Bittersweet Lite hand-dyed Jobelan. Finished size 5 ½" x 5 ¾"